Mother's Day, a special day of the year to let your mom know how much you appreciate all the sacrifices that she has made for you. Cards and flowers fill every store you walk into around this special day. Today I get to celebrate with my mom, who has sacrificed hours upon hours for me -- namely, laying eyeballs on every single picture that I came home with from Buenos Aires, the Falkland Islands, South Georgia and the Antarctic Peninsula. Just when I didn't think she could handle another penguin or seal picture, I would lob a few hundred more at her. Then I got back into her good graces by showing her a few thousand glacier and iceberg photos. I have been lucky enough to not only have a wonderful mom, but to observe motherhood in nature this past winter in some pretty amazing places. In South Georgia, I observed a Gentoo penguin mom feeding its young chick. After hiking through fur seals and up into a small hill, I was greeted with the view of Gentoo penguins nesting with their chicks. In La Jolla, CA I caught a couple of sweet moments with Harbor seal mothers and their days old pups. Imagine the joy my own mom felt when I let her know that I had even more seal pictures to show her (I think those were tears of joy). And of course, here is a picture from a few years ago of my mom and I. Happy Mother's day to my favorite mom! Thank you for all of the support and love throughout the years - I love you! And guess what-- i found more seal pictures! Mom and I in Washington D.C. in October 2010. Happy Mother's Day to all of the moms out there-- of all species! This planet is full of amazing things, and I feel so lucky to have seen a remote part of the Earth last December. This is a King penguin rookery at St. Andrews Bay on South Georgia Island, home to about 250,000 (count 'em) King penguins. Last month, I booked the trip of a lifetime to the "White Continent". More often than not the question, "Why Antarctica?!" comes up. Ever since I was a kid, I have wanted to visit all seven continents, and have wanted to reach the tips of South America, Africa and Antarctica. This trip will satiate two of those life goals, as I will be departing by boat out of the tip of South America. I am envisioning the bluest of blues, the tealest of teals, and the whitest of whites. As a photographer, I cannot wait to interpret these things (Photographer David DuChemin set me straight that I would not be able to capture these things). To be among penguins is something that I have only dreamed of for years. To stand on ice that has been forming for millions of years is just beyond my comprehension. The voyage is slated to travel into the Antarctic Circle, a dream that I hadn't quite realized would be a part of this expedition cruise. As a geographer, this will be really exciting to see the latitude change. Of course, the itinerary is subject to change depending on weather conditions. I know it will be amazing. I'm so excited to experience these things, and I am so excited to bring back images of a part of the world that I have only dreamed I would ever visit. I hope that I will be able to post a few photos here and there, but of course that depends on internet availability. I took a cruise to Mexico earlier this year, and have been hanging onto this image. Doting over this image. Thinking about the pixels in the image and trying to help them out a little bit. So with the new year upon us, it is time to release this image. This little girl was in a mercado in Mazatlan, Mexico. We visited the market upon suggestion of my photojournalist uncle, and I feel like this image is the reason I was there. Certainly not the animal carcasses that my chef boyfriend was so very excited seeing in the meat section. I took some other photos, but this little girl just grabbed me. I was walking by her area, and she saw my camera (I have to work on my stealth) and gave me this little smile as I walked by and got a click. I will work on this photo more as time goes on. But this is my first step in the process of releasing my little girl into the world. Canon 5D Mark II, Tamron 90mm lens. May 2010. 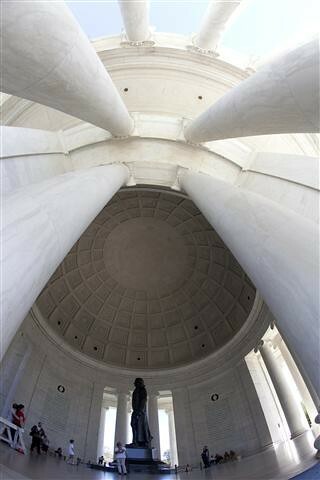 I used the Canon 15mm Fisheye in the Jefferson memorial. 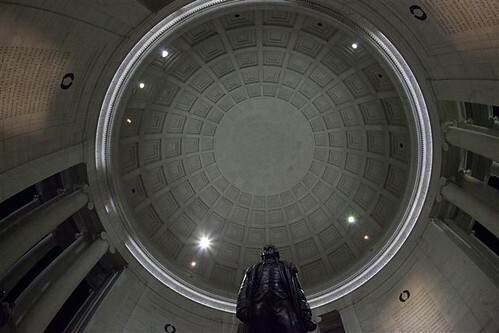 I knew beforehand that this would be the place to use it, as the memorial is round. 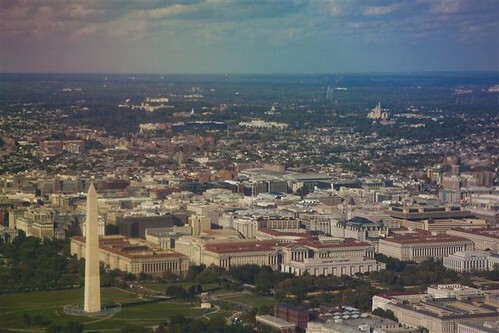 This image is so iconic of Washington D.C. 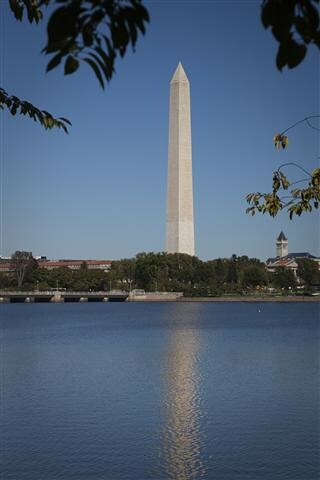 The reflection of the Washington Monument on the Potomac River with a gorgeous blue sky just called to me. I really don't think my tour guide liked me at all, but seriously, how could I just walk by this image? 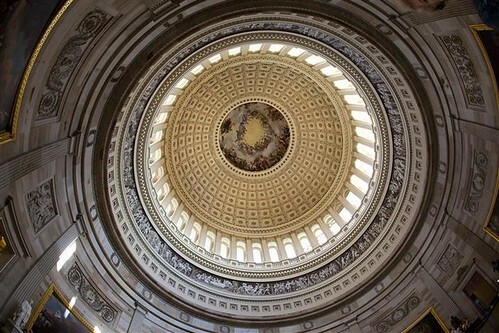 The Capitol was also a place I needed to use the Fisheye. 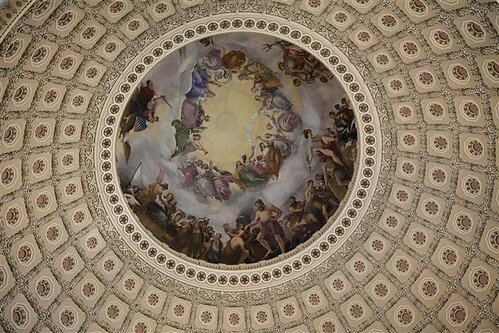 This detail of the Capitol Rotunda is just an image I love. 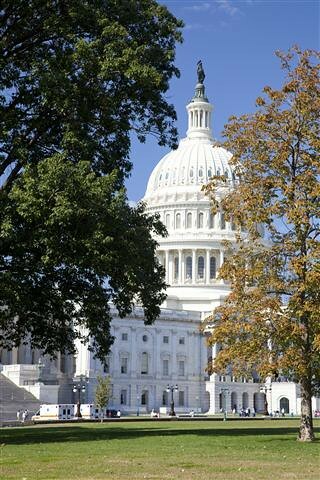 I loved this view of the Captiol, and the image just found me as I was walking by this view. A little bit of fall, and the white against that blue sky brings me back to that day. I have two images that I'm keeping to myself for a little bit. They invoke a specific emotion, and I am trying to find the best way to coax that emotion out of the pixels. As I mentioned previously, I just love flying across the country. Unfortunately, my crappy wonderful little iPhone camera wasn’t able to capture exactly what I love about being airborne (and remember to take your Airborne before you get on a flight, seriously someone hacked up a lung on one of my flights). Oh yes I love seeing the way the landscape below changes. I also love the whole different perspective you get climbing 10,000 feet in the air. 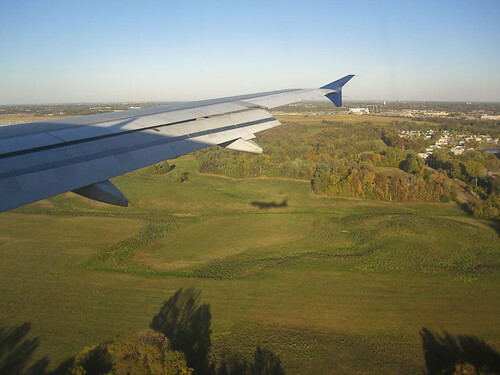 Climbing is the key, as well as descending, because this is when the plane gets a fantastic angle of the world below. Since I knew the lighting would be awesome, I made sure to have the Canon 5D Mark II with me instead of in the overhead bin. I had my trust 24-105 mm lens on for versatility. 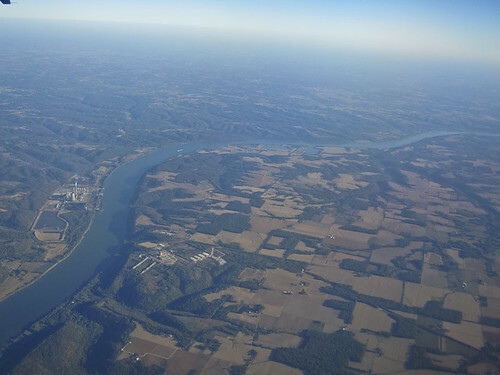 I really need to fly across the middle of the country more to grab some more cool shots. 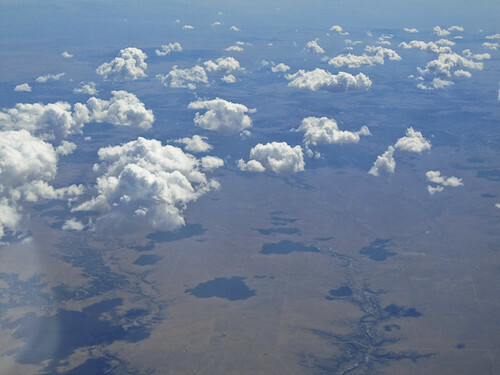 I would love to be right at the point where the land changes from desert to lush vegetation (I think I may have been napping at that point). 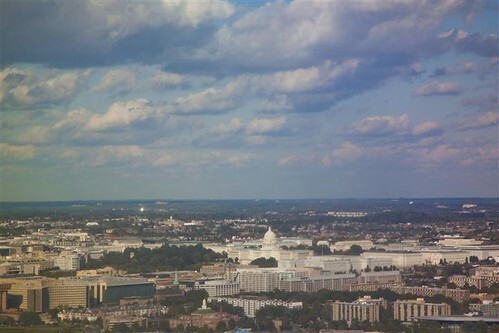 On a work trip to the East Coast and flew to Washington, D.C. To see the sights since I have never been there. It seems that I got here before my luggage did. 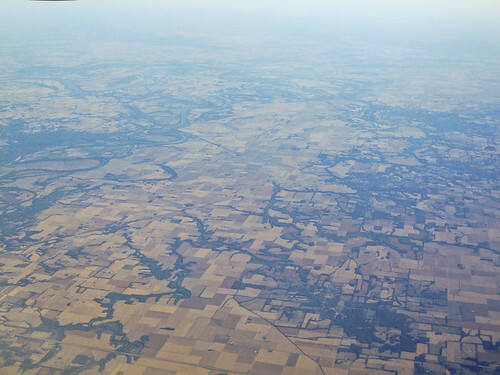 I love sitting right next to the window because as a geographer, I can see the changing patterns of the land below me. As a photographer, I can document the ways the physical geography changes. I made and edited this image in my iPhone somewhere over Missouri (I think). Thanks for stopping by...if you see my luggage, tell it to do the same.